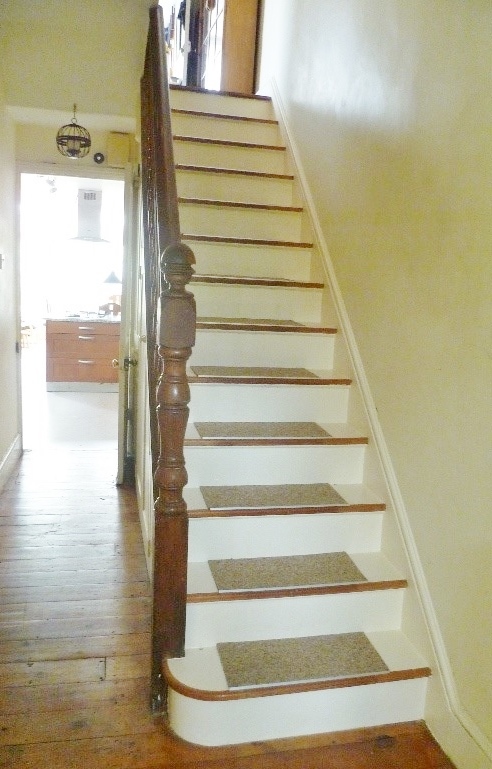 After about 20 years, our stair carpet had become very worn, and we needed to replace it. Carpets have a surprisingly high environmental impact. Problems include toxic emissions, water use, the carbon footprint of the materials used and landfill. We wanted to make the right choice, but it’s confusing. This is what we decided to do, aiming to choose one that would look OK in our house, fit with our environmental principles, be easy to keep clean, durable, and not asthma inducing. My initial thought was to use a natural wool carpet, Some of these look lovely, but we have clothes moth in the house and we didn’t want it to be eaten within a few years, nor have one that was treated with toxic chemicals. John Lewis recommended Brockway wool carpets as being naturally moth resistant, but to confirm I checked with the manufacturer. “There are many carpet manufacturers that do treat their carpet with a chemical that makes the keratin in the wool indigestible. This means that when the moth larvae hatch in the carpet and they eat the wool, the keratin cannot be digested into a food source causing larvae to starve. We choose not to treat our carpets as we do prefer to keep the yarn entirely chemical free. The carpet still has to be eaten for the chemical to be effective so the chemical doesn’t necessarily act as a moth deterrent, but lessens the potential damage that could be caused. After looking at various alternatives (sisal, bamboo, polyester) we chose “econyl” this is an impressive recycled nylon from Aquafil.com , made from recycled fishing nets and carpet waste. Its currently only available in carpet tiles, but of course carpet tiles have real environmental advantages as there’s less waste and it’s easy to replace a single tile if one gets damaged. There is an impressive environmental report on econyl here . The Friends of the Earth’s new office shows some of the exciting design possibilities! See overleaf for how we used econyl based carpet tiles on our stairs. 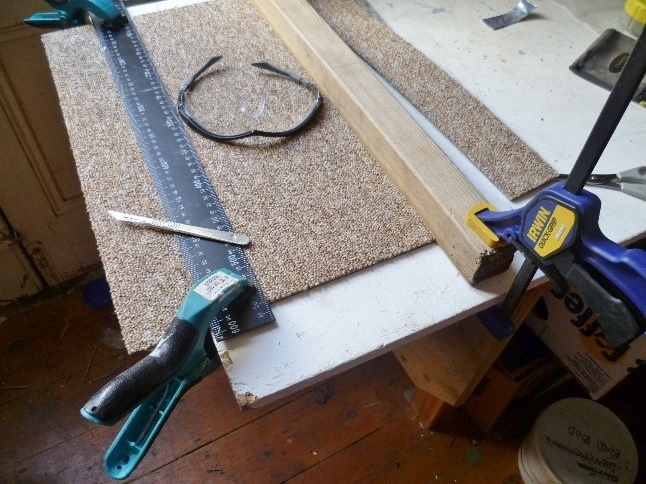 Unlike fitting normal carpet, this is a straightforward DIY job. Each tile will do 2 steps. They are easy to cut neatly with a sharp scalpel, particularly if you arrange it so you can cut part way through (from the fluffy side), then bend the tile to crack through the base layer. I suggest wearing safety glasses, because it’s quite easy to break the scalpel blade while doing this. 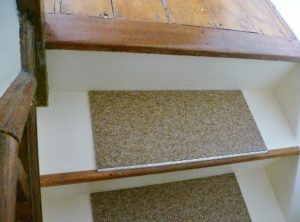 To prepare the stairs, firstly we stripped off the old carpet, revealing a part painted somewhat tatty 1902 staircase. We filled in all the holes made by various nails and staples over the years, then painted to either side of where the carpet tile would be. We decided to leave a 2cm wide strip of unpainted (but oiled) wood at the nose of each stair. This will improve durability, and we like the appearance. 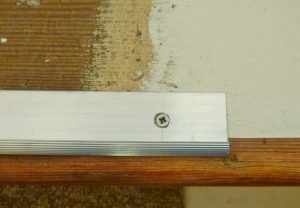 The contrast also makes it easy for those with poor sight to see where the edge of the step is. Creating this is a bit of a fiddle but it’s much easier if using good quality decorators masking tape. We decided it needed a small edging strip at the front to stop the carpet fraying and make the stairs more slip proof. 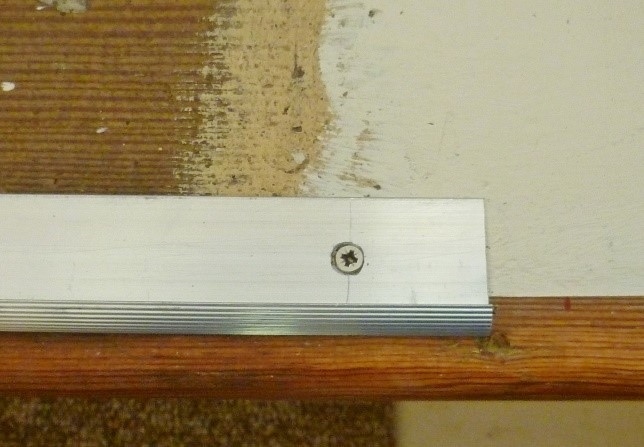 Rather than use the rather ugly conventional commercial nosings, we used a slim aluminium strip: Gradus ACT61. This is widely used by commercial carpet tile installers, but less easy to find in carpet showrooms aimed at domestic consumers. I got the small quantity we needed from the very helpful people at Cambridge Flooring Showroom in Bar Hill. The carpet tiles are then stuck down with double sided carpet tape from Screwfix. This results in a carbon footprint of about 6kg CO2e/step, in comparison to about 14kg CO2e/step for a full width wool carpet. The carpet tiles and aluminium strip cost just £3/ stair, which is substantially less than a wool carpet.